Have you seen the photo of a turkey and a human at a table with a large feast spread out before them? The caption reads, “The only way to have a turkey for dinner.” Instead of being dead on a plate all carved up next to side dishes, the turkey is happily sitting at the table enjoying a vegan meal with the human. My son Noah would be thrilled if a real turkey showed up to enjoy a nice home cooked meal with us. Except inviting a turkey into our small city condo probably isn’t a smart move. Sadly though, Thanksgiving is not a good day for turkeys. Every year 45 million turkeys are brutally killed for Thanksgiving meals. Several years ago I overheard vegan friends say “ThanksLiving” and it resonated with me. I want my holiday to be about life, not death. Turkeys are so full of life with an adventurous spirit, and some of them even like hugs! Turkeys are so much more than a centerpiece that can be stuffed, they are living, breathing, and sentient beings that want to live their lives in peace. Here is how you can celebrate turkeys as friends, not food. Visit And Feed Rescued Turkeys. While Noah and I haven’t yet made it to Farm Sanctuary in the US, we would love to go one day. At Farm Sanctuary’s Celebration for the Turkeys the turkeys enjoy a delicious feast fed to them by humans. Then the humans enjoy a vegan buffet dinner and hang out with like-minded folks. There are two days of events at their New York sanctuary and you can register online (There are also two events at their sanctuary in California that have already passed, but start dreaming for 2019!). 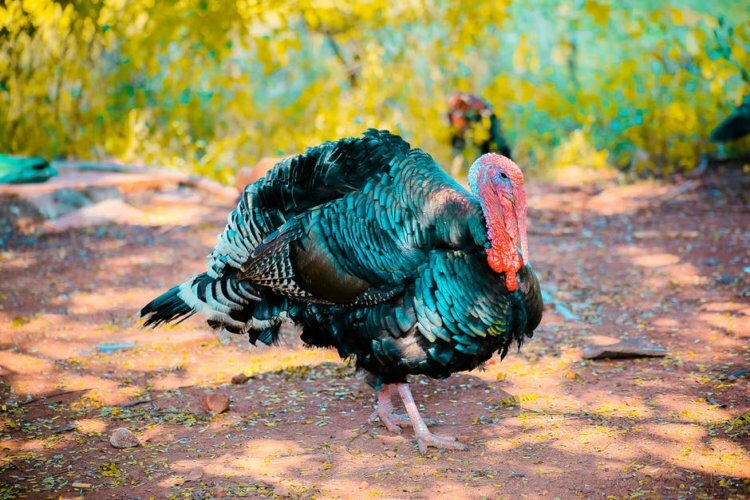 If you can’t make it to a sanctuary you can sponsor a turkey or donate to help one that has been rescued with Farm Sanctuary’s Adopt A Turkey Project. Bring Vegan Side Dishes and Dessert. If you are going to a non-vegan family Thanksgiving feast it might be best to bring your own side dishes. It’s a win-win situation because you won’t be hungry and you get to show your meat-eating family and friends how satisfying and delicious vegan food is. Plant based recipe developer Angela Liddon of Oh She Glows has many tasty recipes to choose from, such as Roasted Butternut Squash Casserole, Bread Free Stuffing Balls, and if you are feeling super creative, try making this Thanksgiving Panzanella. For dessert, why not whip up these gooey and delicious Pumpkin Chocolate Muffins that can be made in one bowl and are vegan, gluten free, and refined sugar free? Yum! Host Your Own Dinner. There are so many wonderful plant-based holiday roasts readily available in grocery stores. Tofurky has been serving up plant-based roasts since 1995, not to mention they also advocate for animal welfare and reinvest in several environmental initiatives. Cruelty free store bought vegan holiday roasts are also available from Field Roast and Gardein. There are also many brands of vegan gravy and stuffing. Alternatively, you can create your own main dish such as this Cauliflower Roast from plant based recipe developer Dana Shultz, creator of Minimalist Baker. If you want to make your dinner potluck style, kindly explain to your guests you don’t eat animals or animal products and give them plant based suggestions such as salads, soups, roasted veggies, mashed potatoes, or grain dishes. Or send them this link to Minimalist Baker’s Vegan Thanksgiving Recipe Roundup so they can pick their own. Meet Other Vegans And Create New Traditions. Thanksgiving is the perfect time to meet other like-minded individuals and create new traditions. Search for groups in your city on the Meet Up website or Facebook, and see if anyone is up for getting together for the holiday. You may be pleasantly surprised how many vegan peeps are looking for the same thing you are. If it’s your first time meeting up, suggest a few vegan restaurants in your area that are having a holiday celebration and break some vegan bread with new friends. Give Thanks To Others. Thanksgiving is about so much more than food. A festive meal is definitely something to be thankful for, but not everybody has this luxury. Before Noah was born, I met a man named Alan who was living on the street near my home. Alan changed my entire way of thinking about the label “homeless.” I did my best to help Alan with food, supplies, and conversation. He used to tell me how lonely the holidays were for him because the streets were deserted as everyone was inside celebrating or out of town. But one Thanksgiving a woman Alan never met cooked him a special dinner and brought it outside for him. He told me it meant the world to him. If you live in a big city, chances are there are people living on the street that would love a hot home cooked meal. You can also volunteer to prepare or serve a meal at a local food kitchen. So while you are busy gathering ingredients to create your holiday feast, consider making a little extra this year so you can bring a vegan meal to someone that will really appreciate it, probably more than you will ever know.